There is a classic dish made from herring that Swedes eat at every holiday, may it be Easter, Midsummer or Christmas, the herring is a staple on the table. I have never enjoyed it as a child, prior to becoming a vegetarian. But the various sauces and techniques to flavour the herring, is something that I’ve always found fascinating from a foodie perspective. I made this version of the most classical of the flavours with seaweed caviar. I will experiment with king oyster mushrooms as well, but thats for another recipe. Slice the aubergine in equally thick slices (about 1 cm thick). Steam for 3-5 minutes until tender but still tight. Let cool off. Chop the onion, chives and dill. 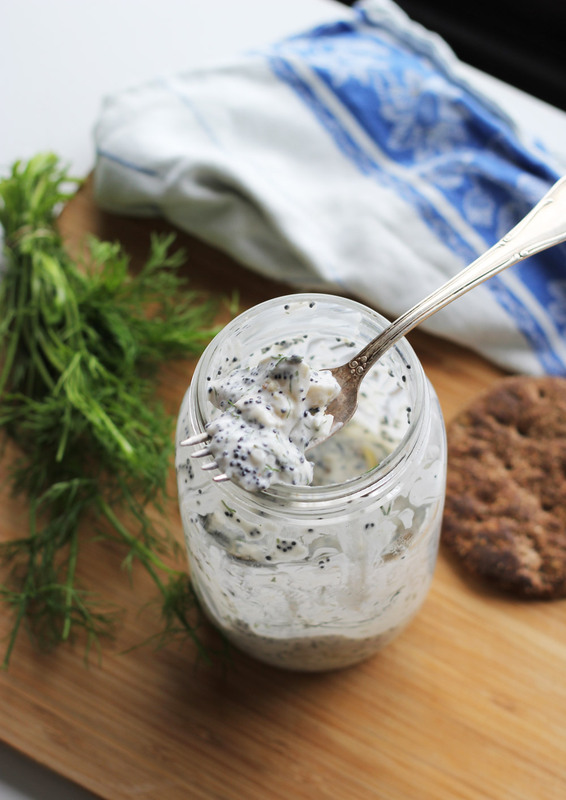 Blend with the oat creme fraiche, and lastly add the seaweed caviar in a jar. Once the aubergine has cooled off, slice the longer pieces into smaller squares. If you prefer, remove the black skin on the aubergine. I tend to do that because I prefer that smooth texture. Blend with the oat crème fraîche. Last for a week or so in the fridge.